Image via WikipediaSo now that you have decided to start training for a marathon, the question arises as to how one exactly trains for a marathon? 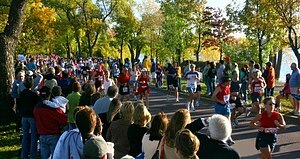 A marathon is a little more that forty two kilometers long, making a little over twenty six miles. Don’t get discouraged, you can do it, but it’s going to take a lot of hard work, which will be totally worth it when you cross that finish and accomplish your goal! The first thing you need to do is to start off slow. If you haven’t run in a long time or this is your first time in serious running, you should check out a blog we wrote earlier taking about the right running stance, and in the beginning training, don`’t worry about distance but just get your body use to running and work on correcting your running stance. At the beginning, work up to being able to run for a half a hour, once you have reach that point, it’s time to find and sign up for your first marathon. You probably need at least fourteen to sixteen weeks of serious training to get ready for a marathon. One of the most important things is to take rest days seriously, meaning that you don’t go running which will help you avoid injury. You need to discipline yourself to train probably four days a week with three rest days spread out every week. Do not kill yourself by running more than five miles more than once a week, meaning only one day should be focused on long distance a week. Work up to it, by starting at five miles and adding one or two every week, then with two weeks till the marathon, tackle the long haul of twenty seven. The last week, go easy allowing your body to rest before the big day. If you have any questions, Dr. Teichman would love to talk to you about training and how to start. Contact him at East Penn Foot & Ankle Associates.